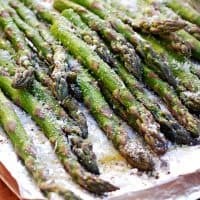 GRILLED PARMESAN ASPARAGUS — Fresh asparagus spears are cooked on the grill with a dash of garlic salt, then finished off with a sprinkling of grated Parmesan cheese. Easy, healthy and delicious! I’m so excited that market season is finally here again! I love sharing weekly farmers market recipes and I’m already looking forward to what this season has in store. This week I picked up some fresh asparagus at my local market for this Grilled Parmesan Asparagus. If you’ve never tried grilling asparagus, you really should. It’s super simple and has a wonderful flavor. You can place a pan right on the grill or use a grilling basket. Or you can do what I do and just construct a make-shift grilling tray out of some aluminum foil, which makes clean-up a breeze! We like to grill our asparagus with some olive oil, garlic salt and pepper, then finish it off with a sprinkling of Parmesan cheese. Even my picky eaters enjoy it cooked this way! Feel free to substitute butter for olive oil or mix up the seasonings to suit your tastes. 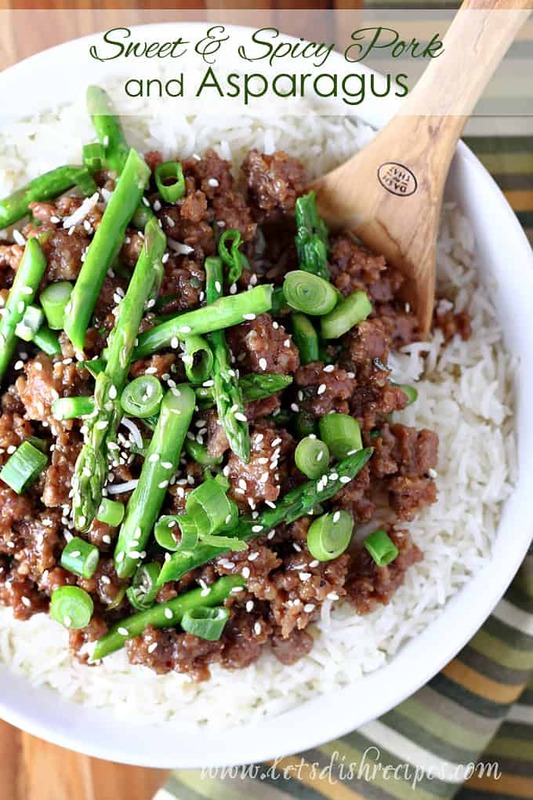 Asparagus is one of my favorite Spring vegetables, and even my kids like it. I especially love that it cooks up so quickly and tastes delicious with nothing more than a bit of olive oil or butter and a dash of salt and pepper. 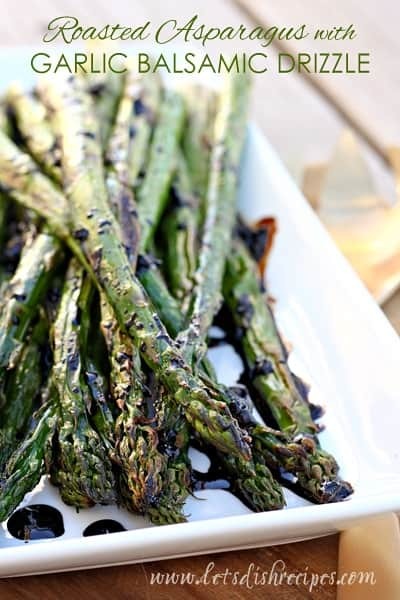 When choosing asparagus look for firm stems with bright green or violet-tinged spears. Size doesn’t really tell you much about quality or flavor. Thicker asparagus is just more mature. Be sure to save this Grilled Parmesan Asparagus recipe to your favorite Pinterest board for later. Fresh asparagus spears are cooked on the grill with a dash of garlic salt, then finished off with a sprinkling of grated Parmesan cheese. Easy, healthy and delicious! 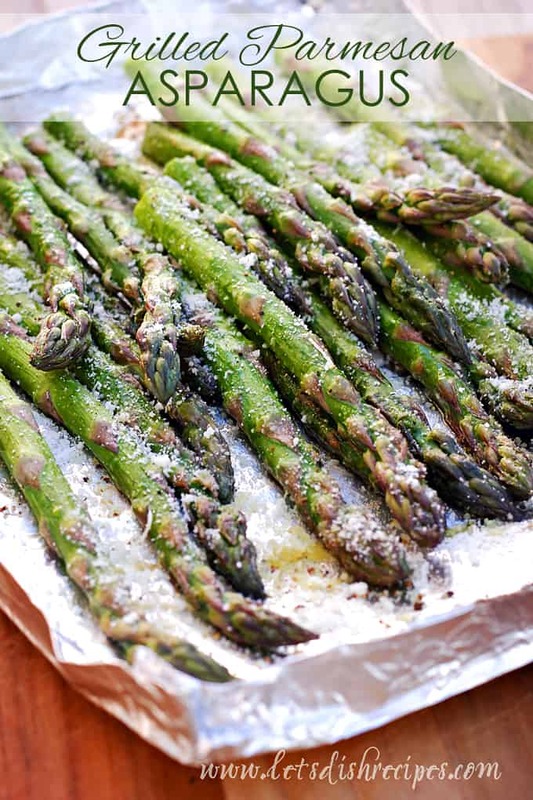 Using a double thickness of aluminum foil, make a tray with raised sides to hold the asparagus. You can also use a small baking pan with sides, just make sure you don't mind putting it on the grill. Drizzle the aluminum tray or baking pan with a bit of olive oil. Place the asparagus on the pan in a single layer. Drizzle with another tablespoon or so of olive oil, then sprinkle with garlic salt and pepper. 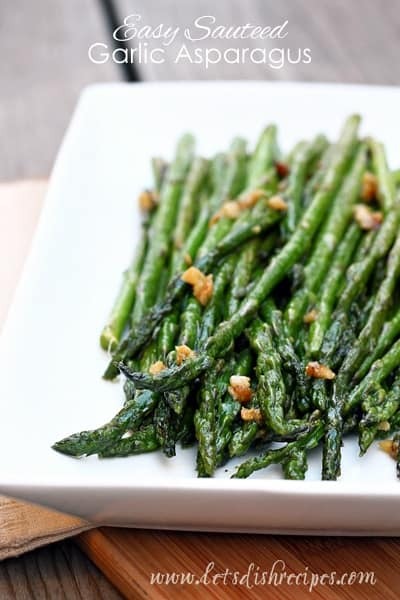 Grill for 7-10 minutes, or until asparagus is crisp-tender. Sprinkle with Parmesan cheese and serve immediately.